Since I didn’t supply a Teaching Point last month, I thought I’d write a slightly more involved one this month. 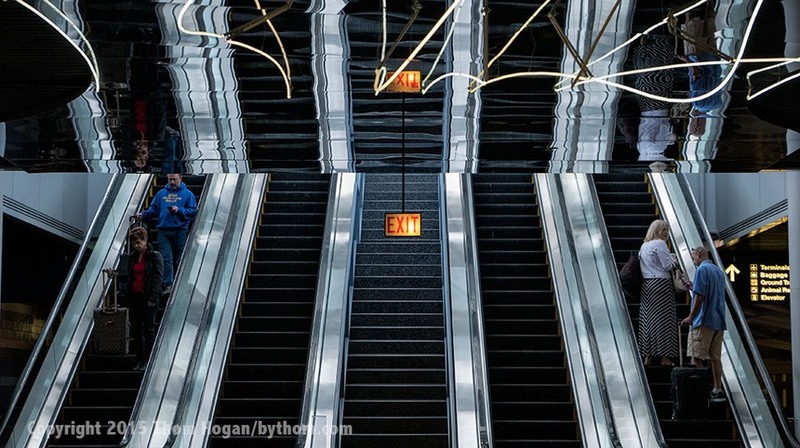 Long-term readers of this site know that I fly through the Chicago O’Hare airport a lot, and that when I have a long-enough layover there, I’ll spend time exploring the underground connector between Terminal B and C in the United portion of the airport. My goal is always the same: find new photos I haven’t seen before. Given that I’ve been doing this for decades now, you’d think that I’d have run out of things to photograph by now. But that’s my first point this month: photography is both temporal and experiential. Places are never exactly the same each time you return to them. Indeed, that’s a bit of the theme of this month’s main photo (above). But how did I get to that shot? So let’s be literal. 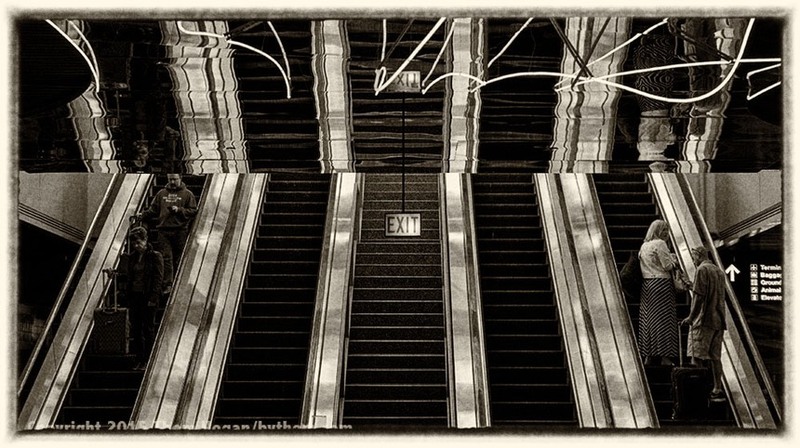 As I came down the escalator into the connector I already had my LX-100 out and was looking for something “new” that struck me. Since the key element of the art installation there is the neon lights over the moving walkways, they tend to be the thing you focus on first. But I’ve looked at that neon quite a bit at this point, so I almost immediately start with the opposite these days: what’s there that isn’t the neon lights that are so famous and so photographed? From a compositional sense, I still had problems with this, as it feels a bit like a right-handed image to me (closed on the right, open on the left). Without any real reason for the eye to go left, I don’t think it’s strong enough. I could, I suppose, brighten the passengers entering the walkway at left, or wait for a very interesting traveler to arrive there. Some of you who’ve been there will say, “but wait for the neon lights to come on!” Yes, true. It is a little stronger with the neon lights glowing, but remember, I was looking for a shot that wasn’t about the neon. I’ve got hundreds, probably thousands of shots with the neon, and some very good ones. Which brings me to a second point: what I’m doing here is challenging myself to go behind the obvious shots. Go beyond the shots I know that are there. Go beyond the shots I’ve done before. I’m trying to stretch what I can do in that space and look at it more creatively and differently than I’ve done before. Many of you ask me “how do you keep from taking the same shot over and over?” That’s especially a problem for landscape photographers. Hey, Half Dome has been photographed a few times ;~). Even by me. The way you find the shots that others don’t get is to stretch yourself. Here’s an idea: hold you hand up so you can’t see the neon (or main thing in the space you’re photographing). Now what do you see? I actually have an extended structure that I use in these situations that I’ll eventually get around to documenting (in my usual excess). But there are plenty of little tricks you can use: hide the obvious, move around, look behind you, don’t stay at eye level, put something (or wait for something to come) into the scene, or change your aspect ratio, just to name a few. A lot of photographers restrict themselves arbitrarily by resisting using their imagination. Photography is about reality, isn’t it? No, it is not. Photography is about interpretation of a place and moment due to the decisions you make (what camera to use, where to point it, which lens is mounted, what aperture is used, what shutter speed, what filtration, and a huge list of other things that you’re making decisions about). They’re your decisions, not reality’s decisions! So why not take control of them and claim ownership of them? I’m going to go astray for a moment and say that this even applies to photographs we tend to think of as alike, such as “standard portraits.” The other evening Tony Medici—the second instructor I bring on my workshops—was shooting portraits for a local theatre group that we work with (I do video, Tony does stills). You can tell that Tony has an engineering background: he’s somewhat meticulous at setting things up to exacting standards and getting very repeatable results. Which should be great for head shot portraits, right? Yes and no. The one thing that I do that I think Tony still doesn’t quite do enough of is try to get the subject to be spontaneous and fully show their personality. Yes, the lighting, angle, focal length, all the technical aspects are basically the same for every portrait taken with his basic set up. It results in great shots of those people. But does it expose their personality? Not unless the photographer gets involved. First, you have to recognize that the subject is just giving you what you asked for, not being themselves. 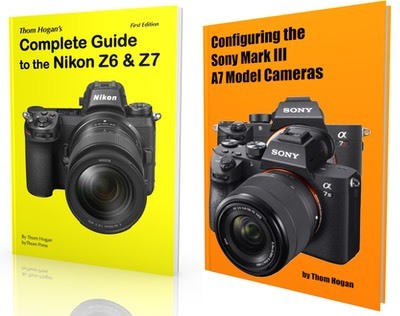 Second, you have to have an interaction with the subject that gets them to stop thinking about all that expensive gear pointed at them and what it is being used for, and instead just being themselves. When their attention is on their interaction with you, they relax and start to reveal their personality more. The great portraitists will tell you that the angle of the body, the angle of the head, the lack of wrinkles on the clothing (or the face when they smile), whether the eyes are fully open, whether loose hairs are going astray or blocking anything, and a host of other things “need to be right” for the “perfect portrait.” Then you look at their very best work and I’ll bet you that they violated one of their own rules! It’s the portraits that get to the personality of the subject, not the technically correct ones, that really engage us. I told you I was going astray. But it’s a good astray. Because landscape photographers, architectural documenters, sports shooters, basically any type of photographer tends to build meticulous sets of rules to “get it right.” To me, those rules tend to make them produce somewhat static and stale photographs. Photographs we’ve seen before, and which don’t involve your emotional reaction in any way. So what did I do next at O’Hare? The interesting thing about this shot is that as abstract as it is, if you’ve ever been there, you’ll immediately recognize it. One of the things I was playing with was variations on “exit.” If you stand there long enough, you can probably shoot virtually every variation possible, including only people actually exiting the connector, or as I’ve done here, balancing people exiting Terminal B with people exiting the connector. There’s no wrong decision. I only show this particular example to illustrate that “double exit” thing I was thinking about. But the big thing I learned from the great photographers I’ve worked with over the years is simple: exhaust a possibility and keep moving. Exhaust more possibilities. One of two things is going to happen: (1) you’re going to find a better possibility down the line, or (2) you’re going to verify that you’ve already found the best possibility (today) and can then simply go back to it and work it some more. And we’re back to this month’s main image: the minute I saw the ladders I knew I wanted to photograph that scene, as I was pretty sure the opportunity was temporal and wouldn’t be there the next time I walk down the connector. That alone compelled me to photograph it. But more importantly, it’s what I said up front: I’m challenging myself to find new images in a fixed place, and the work going on behind the connector’s walls that leaked through the lit panel definitely was new and interesting to me. Thus, once found, I knew I’d photograph it. I’m always stunned in National Parks. 90% of the photography done in a National Park goes like this: drive to a known spot (or any “turnout”), get out, walk to the edge or platform or whatever, take a photo, go back to your car. Repeat at each turnout or wherever you see another car parked. If you’re hiking, the same thing applies, only you don’t do it with a car ;~). 99% of the other 10% consists of some form of this variation: see someone taking a picture, stop, go to where they were and take a photo. Repeat. Just a word of warning: I’ll often fake taking pictures and point my camera in random directions and ways in National Parks just to be amused by how many people will come over and “take the same shot.” Once they’re gone, I’ll go back to trying to figure out where my shot is and why. Frankly, I’ve never understood why most people want exactly the same shots as everyone else. Maybe its a socialization thing I don’t understand (remember, I’m an unmarried only child who was a latch-key kid; I get by fine without other people around). Generally, though, the images that we respond to as viewers are things we haven’t seen before, whether it be a place, an expression, a lighting effect, or something else. That means that you have to look for unique, not same. 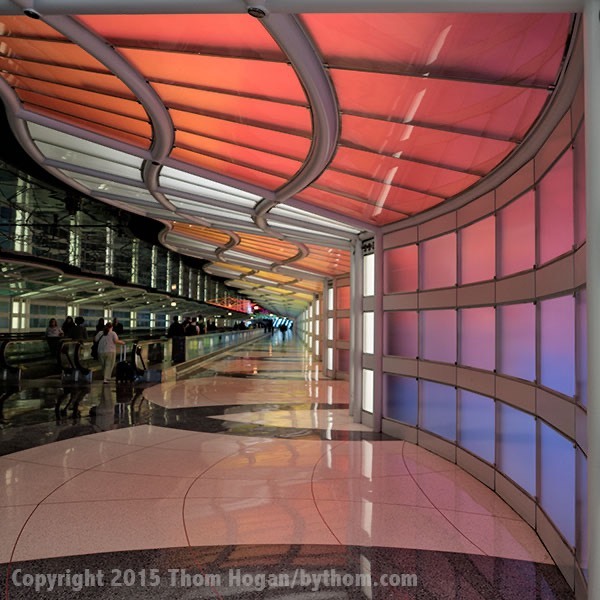 Find your own O’Hare: a place you can regularly visit that is a fairly restrictive space, but an interesting one to you photographically. Perform the following two exercises each time you go there: (1) take a “better” version of a photo you’ve already taken; and (2) find a photograph you hadn’t seen before and work it. I know photographers who’ve made a living just taking macro shots in their backyard. You don’t need to travel far. You don’t need a place that’s never been seen before. You don’t need better equipment than other photographers. What you need is an open mind and a bit of exploration. Imagine. Envision. Create.